You will not find a more stunning place to spend a summer month than the Presidio in San Francisco. The green fields and cool breezes sweeping past the Golden Gate Bridge make the Wiki Education Foundation’s house on the historic former army base a perfect retreat to think about the future of Wikipedia. I’m honored to be Wiki Ed’s first summer research fellow. In 2003, I was the first professor to use Wikipedia in a large classroom setting. Today, Wiki Ed leads the way in the US by working with institutions, instructors, and students in a wide array of disciplines. One of the benefits of the fellowship was learning from its past work to draw inspiration for new projects. We affirmed some ideas, created some new ones, and found many places ripe for collaboration. I’ll be sharing our findings in this post, tackling connections between Wiki Ed and Galleries, Libraries, Archives, and Museums (GLAM) and exploring alternative methods of engaging experts. During my fellowship, I had time to contemplate on a year’s worth of work, and to interact with staff working on the front lines of higher education and Wikipedia. This post will explore some alternative engagement strategies. Particularly, how do we engage experts from academia (and beyond) to contribute to Wikipedia — experts who may be too busy to commit to editing articles? How can we adopt alternative methods of improving Wikipedia’s content? 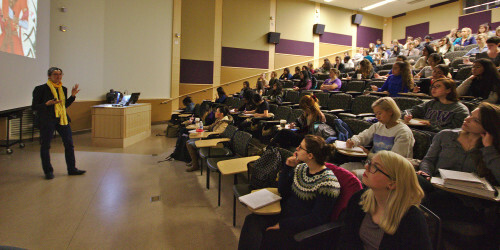 Dr. Sasha Welland’s Global Feminist Art course at the University of Washington. One path comes from my educational collaborations with the Smithsonian National Museum of the American Indian. For that work, students do “backtracking” of articles. They identify the most prolific editors of an article, and what significant viewpoints were (or were not) represented by their edits. Similarly, Wiki Ed’s Sage Ross worked with Dr. Sasha Welland’s Global Feminist Art course at the University of Washington to do “gap analysis.” That analysis determined weak areas in topic coverage. Another promising experiment came from a collaboration between my class and the Smithsonian American Art Museum. Their top curator for statues, Karen Lemmey, provided a critique of Wikipedia’s article on a famous statue, The Greek Slave. We recorded her talk on video, which provided a verbal road map for improving the article. For example, she pointed out the correct terminology for the article’s lead sentence, and including a comprehensive list of statue copies. We uploaded this video-critique to Wikimedia Commons and embedded it into the article’s Talk page. This was an easy way for experts to record recommendations and advice for later editing. What is inspiring about this case is that Wikipedia gave something back to Dr. Lemmey’s work. While she had issues with The Greek Slave article, she also noted the power of Wikipedia for her scholarship. In the article about the statue’s artist, Hiram Powers, she discovered a link to an archive of Powers’ personal correspondence. She hadn’t seen that archive before. The entry in the “External links” section was added by the University of Vermont Library Center for Digital Initiatives, the owner of the collection. In this case, where Wikipedia connected two researchers, we see the power of Wikipedia as a hub for academic research. Interdisciplinary dialogue and collaboration in academia is notoriously difficult. Examples like this show how Wikipedia might help break down barriers by aggregating the world’s best scholarship in one place. My Summer Fellowship at Wiki Ed has also intersected with my own work in Galleries, libraries, archives, and museums (GLAM). Putting these ideas together provides new ways to engage experts and students as alternatives to editing articles. I’d like to take edit-a-thons one step further. I’ve worked with students to create a physical pop-up exhibit about Wikipedia. This pop-up display offers newcomers a literal walk-through that illustrates Wikipedia’s basics: neutral point of view, reliable sourcing, verifiability, editing syntax, image uploading, and Creative Commons licensing. Wiki Ed has made printed brochures and handouts a cornerstone of their classroom support. Similarly, these banner displays provide a self-paced, comprehensive learning opportunity during meet-ups. This year, a Knight Foundation grant allowed us to place a version of these posters as an exhibit at the National Archives and Records Administration (NARA). The “Wikipedia Space” will be the first facility in the U.S. where anyone can learn about Wikipedia in an offline environment. It will be a locus for Wikipedia activities in the NARA Innovation Hub. That helped us reimagine outreach in real space, where people could literally “walk through” Wikipedia’s history and practices. Talking to Wiki Ed staff was an opportunity to take the idea further, by converting the exhibit into a poster for students and teachers. I was particularly interested in high schools. Though Wiki Ed is focused on higher ed, staff suggested some helpful findings. Particularly, they reported instructor’s comments that high school students often have unusually conservative views about Wikipedia’s use and reliability, even while relying on it for their assignments. Whether this is an expectation bias to align themselves with the mythology that Wikipedia is forbidden at the college level, or high school teachers preaching in generalities about the dangers lurking in Wikipedia, this is a media literacy challenge at a critical stage in a student’s development. I wanted to encourage a culture where students learn to evaluate and verify Wikipedia’s sourcing, just as they would any other source, be it Britannica, The New York Times or The Bible. If high school classrooms displayed a poster about Wikipedia’s proper use and role in the learning process, that would be a huge win. Drawing from Wiki Ed’s expertise and contacts with hundreds of instructors’ experiences in higher ed, this campaign would also impact Wiki Ed’s work in the future by challenging ideas and expectations of Wikipedia before students enroll in a college or university. These projects are among some of the ideas and collaborations I contributed to or participated in during my time at Wiki Ed. It’s an exciting time. These are all areas explored at this year’s WikiConference USA in Washington, D.C. Wiki Ed staff and I presented sessions about these topics and asked attendees to brainstorm new areas. We still invite people to help pitch in and provide ideas and solutions to this ongoing project. Photo: Andrew Lih speaks alongside Wiki Education Foundation staff at the National Archives during WikiConference USA 2015. (Source).